Happy birthday to James Drury – 85 today. The Virginian (James Drury) and Trampas (Doug McClure). Happy birthday to Gary Clarke who is 85 today. It was a great disappointment to his fans that he couldn’t remain on The Virginian for its entire run. Good to see he’s still very active working on new film projects. Cozi TV have begun broadcasting the Morgan Starr episodes. Since my original post back in 2013 I can approach Starr with a new perspective. The introductory episode is arguably one of the better episodes of an uneven season. At first glace Starr’s stern manner is a stark contrast to Judge Garth, but as the episode progresses his relationship with Jennifer softens and we see a lighter side to his character. It is still hard to accept Judge Garth would have recommended a surly authoritarian to succeed him at Shiloh. And just as difficult to accept that The Virginian turned down the job as boss of Shiloh ranch given the fact he admits to Starr that his allegiance to Judge Garth is paramount. The introduction to Starr by Garth in person before he assumed his Governor position would have eased the transition for viewers. Instead we got a sudden departure without any goodbye. Apparently Lee J. Cobb didn’t want to stay around longer than he had to. With all its faults “Morgan Starr” remains an interesting episode. A pity Trampas was absent for such a key episode. INSP have begun broadcasting the Morgan Starr episodes. 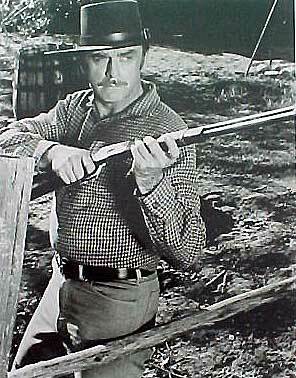 Arguably the least popular addition to the Shiloh “family” – Morgan Starr succeeded Judge Garth as the boss at Shiloh Ranch for a brief period during Season 4. The dark tone of Starr’s episodes was in stark contrast to Judge Garth. Starr’s stern, abrasive manner and military type persona was ill fitting for a show that relied on a friendly extended family at Shiloh Ranch. Green Valley, AZ — Caribou Moving Pictures Producer Daryl Mallett has recently announced that actor/writer Gary Clarke will join the Caribou production company, bringing with him two feature films he has written, Greenbriar and Viva, McDuff! Clarke will direct Greenbriar, while Viva, McDuff! will be directed by Caribou Staff Director… Ethan Moe (Rosa Peligrosa, The Message, Retrocausality). Clarke’s very first professional job was in 1957 as the lead in a movie aptly named Dragstrip Riot. (Clarke says that your life will be incomplete until you see it.) While he’s appeared in many shows over the years, he is best-known for his role as “Steve Hill” on the western television series, The Virginian. He has more recently appeared in The Paperboy with Matthew McConaughey, Nicole Kidman and Zac Ephron; Tombstone, with Kurt Russell and Sam Elliott; and Parkland with Zac Ephron (again). Greenbriar is a murder mystery comedy that takes place in a mansion of the same name. Will it remain the crime-fighting mansion it used to be, or will it be turned into the old folks home the state wants it to be? 65-year-old Emma Eames, Greenbriar’s current owner and Girl Friday to the late, great criminologist, Zachary Charles King, goes to war with the state. They are about to learn that many are the dastardly villains who have crossed swords with her and discovered, only too late, that she and her gang are one gaggle of geriatric geezers you don’t want to mess with. Viva, McDuff! is a comedy western. It’s 1885 and Eddie, a naïve 17-year-old, is on his way to prison wrongly accused of shooting Sheriff Whipple, his young sweetheart’s dad. But, he has an infallible plan: Escape, cross the border into Mexico and plead with McDuff, the meanest “bandido” leader in the whole southwest (and the real killer), to come back to Texas and give himself up, or at least write a nice note of confession, “’Cause, gee whiz, ain’t that the right thing to do?” Cavalry, federales, bandits, true love and $400,000 are at the center of this twisty, turney tale. “These are two films the likes of which have not been seen for a long, long time. I promise that you’ll laugh a lot, talk about them a lot, then go see them again,” said Clarke. Caribou has started development on both projects, with filming slated to begin in late 2018/early 2019.